Aimersoft Apple TV Converter Suite is an all-in-one Apple TV conversion tool bundled by two outstanding Apple TV converters: DVD to Apple TV Converter and Apple TV Movie Converter, helps you easily convert DVD and Video to mp4 for Apple TV. This excellent Apple TV converter also provides you with rich options such as customizing file size, movie trimming, video crop, subtitle selection, audio track selection and so forth. A powerful Apple TV Converter help you rip DVD and convert video to Apple TV. An Apple TV software with high level customization. Let you convert your DVD and video files to Apple TV with the resolution, frame rate, video bit rate and sample rate you prefer. Fully support PAL and NTSC TV standards. Support batch conversions and customize video profile, you need not to click time and time again for setting as once you save your individual setting as profile, make your conversion much easier. A professional video converter that support various video aspect ratios such as 16:9, 4:3 and full screen. Capture and save your favorite movie pictures on your computer as jpeg or bmp files. Multi-language supported and intuitive interface, convert video easily for you. Fully support dual-core, multi-threading and Windows Vista. Free e-mail technical support; provide the best service for you. Suite for convert DVD and video to Apple TV supported format. Cucusoft Apple TV Converter Suite is the top rated Apple TV video converter. provides you upgrading service all through your life. Convert video formats to Apple TV video MP4, MPEG-4. Qweas is providing links to Aimersoft Apple TV Converter Suite 2.2.0.22 as a courtesy, and makes no representations regarding Aimersoft Apple TV Converter Suite or any other applications or any information related thereto. Any questions, complaints or claims regarding this application Aimersoft Apple TV Converter Suite 2.2.0.22 must be directed to the appropriate software vendor. 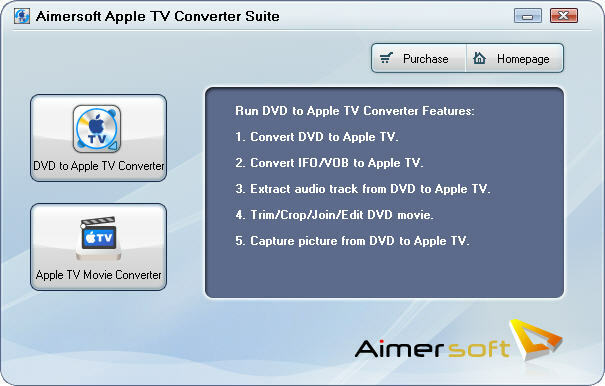 You may click the publisher link of Aimersoft Apple TV Converter Suite on the top of this page to get more details about the vendor.